For tracking pose, the easiest way is use WaveVR_PoseTrackerManager.cs . This script manages all pose tracking behaviors. 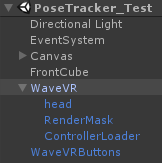 If developer adds component WaveVR_PoseTrackerManager.cs to a GameObject (e.g. Generic_MC_R(Clone)) and WaveVR_PoseTrackerManager.cs is specified to a device (e.g. Dominant). 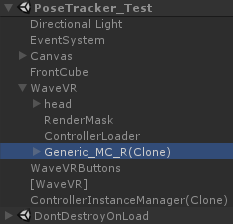 Thus, if Dominant is lost-tracking (or disconnected), WaveVR_PoseTrackerManager.cs will hide the children objects of Generic_MC_R(Clone). Developer can see that WaveVR_PoseTrackerManager.cs is added to Generic_MC_R(Clone). So if Dominant is lost-tracking, the children objects (MIA_Ctrl, BeamR, ControllerPointerR) will be hidden (disabled). Note: the GameObject to which WaveVR_PoseTrackerManager.cs is added will NOT be disabled by WaveVR_PoseTrackerManager.cs . Press Play key to play scene in editor mode, Generic_MC_R(clone) controller will be generated. It uses WaveVR_PoseTrackerManager . We can see head and ControllerLoader (prefab from Assets/WaveVR/Prefabs/) under WaveVR. This is used to demonstrate that controller uses localPosition of head and beneath the same parent. In inspector of WaveVR, we can see Y axis rotates 90 degree. Thus in editor mode, it has to turn head around 90 degree to see FrontCube . Looking at Inspector of head. 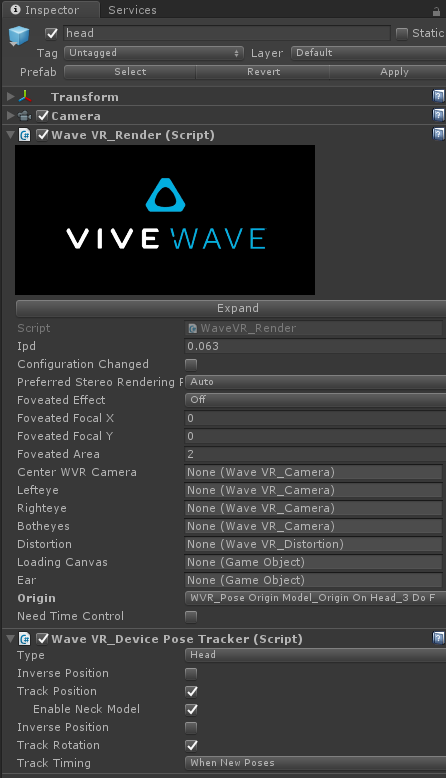 Script WaveVR_DevicePoseTracker has Type with Head. There is a option named Enable Neck Model. 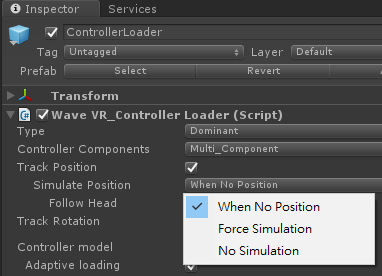 This option takes effect only when the Origin of WaveVR_Render is WVR_Pose Origin Model_Origin On Head_3 DoF. When the option is checked, WaveVR will simulate head position in 3DoF (rotation only) environment. In Editor mode, use the mouse and keyboard to simulate the controller. In all tracking pose scripts, there is a Timing option. If developer chosen When New Poses, device pose would be updated before rendering. If developer chosen When Update, device pose would be updated at end of each frame. Pose of object will be updated each frame in OnNewPoses. 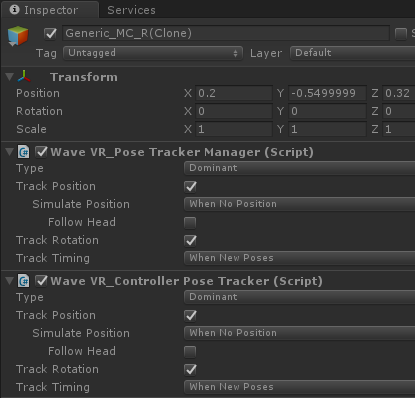 Also, you can see the Inverse Pos and Inverse Rotation checkboxes in WaveVR_DevicePoseTracker. These are used to inverse the position and rotation of the pose. For example, when you are looking at a ball and moving left, the ball looks like its moving in the opposite direction (moving to the right). WaveVR_PoseTrackerManager provices options for pose simulation. If Track Position is checked, Simulate Position checkbox will show. When No Position: if device does NOT have position, use simulation positon. Force Simulation: use simulation position anyway. No Simulation: do NOT use simulation position.